FiBL is receiving numerous enquiries related to data on organic agriculture. In this section of our Organic-World.net website we are making the questions and our answers public. We are looking for data on organic lentins, millet and peas from Kazakhstan and Ukraine. Do you have such data? Develpment of organic beehived 2017-2015. Source: FiBL surveys 2009-2017. Graph: FiBL. Note: The increase from 2014 to 2015 is due to the fact that data for some countries such as Brazil was available for the first time. I am writing to you as I am seeking for data on organic farming, in particular concerning the apiculture sector. Is this taken into account in any of FiBL surveys? quantity of organic honey produced at EU-Member State level? We have data on the number of organic beehives. Some countries provided data on honey production and even less on the number of organic beekeepers. We have compiled an excel file with these data, which dan be downloaded from this website. Furthermore, information on organic beehives is available on page 91 of "The World of Organic Agriculture 2017". Slides on organic beehives are available from FiBL as part of its slide collection on crops. For information about organic apiculture see the website of the the IFOAM Organic Apiculture Forum http://www.organicbeekeeping.info/home.html. Do you have data on organic viticulture? Yes, we have - at least for the area. They can be found here orgprints.org/31416/ and in our yearbook on page 118. I have a question I hope you could help me with. In the chapter The Global Market for Organic Food and Drink in the 2017 edition of "The World of Organic Agriculture", it says that the global sales expanded by 10 percent to 81.6 billion USD in 2015. From last year’s report, the sales were 80 billion USD. What I don’t get is the 10 percent increase – is this measured in some other unit? The problem is that the exchange rate Euros/US Dollars changed substantially in 2015 (the euro dropped against the US dollar). If we compare the 2014 with the 2015 data in Euros (60 vs ca. 73 billion*), we have an increase of more than 20 percent. If we compare it in US dollars (80 vs. 81.6 billion USD), the global organic market increased by 2 percent. We always use the average annual exchange rate for calculating the market. Globally 10 percent growth should be about right. We had more than that in most European markets and 11 percent in the US. *Please note that the data from our FiBL survey differ slightly from those from Organic Monitor that include their own estimations into the calculations, but the result stays the same. (FiBL calculated 76 billion euros in 2015 and 63 billion euros in 2014). For a study I am looking for recent information about organic agriculture in Spain. Can you help me with information on that? The most relevant Information related to the market is available at the Website of the Spanish Ministry of Agriculture http://www.magrama.gob.es/es/alimentacion/temas/la-agricultura-ecologica/documentos-de-interes/ - scroll down the page. On our Twitter account we inform about the latest Information here: https://twitter.com/search?q=%40FiBLStatistics%20%20%23OrganicSpain&src=typd. I am a PhD Researcher currently examining organic regulations. I wanted some clarification on statistics of FiBL. In The world of organic agriculture. Statistics and emerging trends 2015. FiBL-IFOAM Report it is stated that according to a survey from the Research Institute on Organic Agriculture (FiBL), there are currently 82 countries with organic standards and another 16 countries in a process of drafting regulation. Out of the 82 countries, at least 18 countries have adopted the standards into national legislation. I was wondering whether EU Member States are all individually included in the 82 countries? Furthermore, of the 18 countries that have adopted the standards into national legislation, was the EU counted as one country, or was it not included at all? Is this report by FiBL also publicly available? According to our latest data, 87 countries have an organic Regulation; 18 countries are in the process of drafting an organic regulation. We count the Member States of the European Union indivdually, i.e. 28 countries. Our flagship report "The World of Organic Agriculture", which contains the article on standards and regulations from Beate Huber et al. (page 140), is available online at the FiBL shop see below. There is also a related PowerPoint presentation. Do you have data on organic dairy products in Switzerland? Yes, such data are available from Bio Suisse, which presents the latest market data annually. According to this data, retail sales of organic dairy products amounted to almost 300 Million Swiss Francs, constituting 11.8 percent of all dairy products sold in Switzerland in 2015. Unfortunately Eurostat only has the total for the dried pulses/protein crops. Some national data sources which FiBL uses in some cases, however have more detail. The data can be viewed at www.organic-world.net/statistics/statistics-data-tables/ow-statistics-data-crops.html. Unfortunately not on all indicatores mentioned data are available. 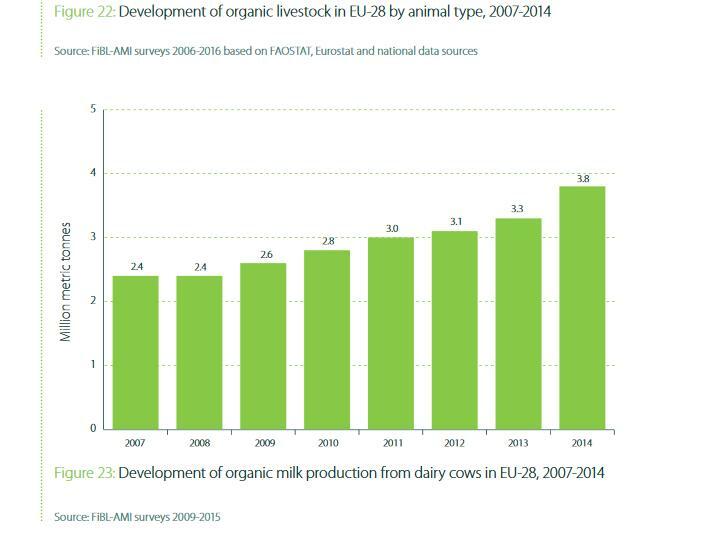 Milk production data and dairy cow numbers are available from the Eurostat database > Organic farming. In the book Organic in Europe we have published a table on organic cows' milk production in the EU and we have prepared a table with the organic shares of the overall market for some selected commodities and commodity groups (see graphs on left). I am looking for a high resolution version of your map on organic agriculture in the 2016 edition of "The World of Organic Agriculture. Where can I download this? I am writing my master thesis about the potential for natural herbal solutions instead of using coccidiostats for layer hens and in broiler production. I need to know how many broilers are produced per country and how many layer hens do they have. Do you have organic poultry data? Unfortunately organic poultry data is very incomplete and we do not have data for all countries. Please note that from the data sources it is not clear if the figures refer to the average stock for the given year or to the number of slaughter animals. This lack of information on the methodology makes this data difficult to compare. We kindly ask you to use this data with caution. I am looking for the latest data on organic livestock numbers in Switzerland. Where would I find them? FiBL has currently not included this data into its online database. However, the data can be extracted from the Swiss Federal Agency of Statistics (BFS) database at https://www.pxweb.bfs.admin.ch/Default.aspx?px_language=de . Recently, the 2015 data were released. I am a student from Russia. Currently I am doing a research, concerning organic agriculture development in Russia. I wonder is there any updated data from FiBl concerning organics in Russia and how is it possible to get this information. We have recently published our latest yearbook on organic agriculture. There you will find the data about Russia http://www.organic-world.net/yearbook/yearbook-2016/pdf.html; data area also available on our online database. http://www.organic-world.net/statistics/statistics-data-tables/ow-statistics-data-key-data.html. Please note that the data about Russia were compiled among certifiers and might not be complete. I am a student looking for updated data on organic viticulture worldwide. Do you have an update of your slide presentation on the theme from a couple of years ago? Yes, the updated vesion of our slides on organic viticulture worldwide is available at http://orgprints.org/29897/ . And our flagship Report "The World of Organic Agriculture" has a chapter on organic grapes on page 106 at http://www.organic-world.net/yearbook/yearbook-2016/pdf.html. I looked at the infographic (see right) about organic production in the UK with interest but was shocked at the figure for arable crops. Defra* published the figure at 41200 ha for 2014 for the UK This figure is about 3.5 x that. I think someone needs to look at it again. We assume the difference is that Defra does not count the “Plants harvested green”, i.e.green fodder, as arable land (UK arable land according to Eurostat more than 140'000 hectares). According to Eurostat, the plants harvested green amount to more than 90’000 hectares. I would like to present the latest figures on organic aquaculture production, and I was wondering if you might have some data on this? Perhaps if you can’t release figures for 2015, could you indicate if the sector is growing? Unfortunately, we don’t have much data on organic aquaculture. We have, however, put together production volumes for 2013, for a new report on sustainable fishery that is currently under production and will be released by the International Institute of Sustainable Development (IISD) in May 2015 (http://www.iisd.org/ssi/). Please note that the data are not complete; for instance data for two major producers - Bangla Desh and the UK are missing. For full dataset see excel file here http://www.organic-world.net/statistics/statistics-data-tables/statistics-data-tables-excel.html#c14579. I am a student at a U.S: University, and I would like to use organic retail sales data available at www.organic-world.net/statistics/statistics-data-tables/maps.html for my semester project, but I have one question that perhaps you could help answer: Is the retail sales data in nominal (current) or real (constant) euros? Thank you in advance for your help. Yes, we always use the annual average exchange rate of the year in question; i.e. the nominal exchange rate as reported by the European Central bank at http://sdw.ecb.europa.eu/browse.do?node=2018794 Hence, it is not possible to make a direct year to year comparison. That needs to be done in the original currency; however, we do not have the data in original currency in our tables/maps. For selected countries we have them though in our offline database, so we could send that if needed. I am a journalist and looking for the latest data on organic in Switzerland. In particular I am interested to see how many farmers have converted to organic recently. Do you have this data? According to the latest data from the Swiss umbrella organisation Bio Suisse, released on April 7, 2016, 220 farmers registered for conversion in 2016. In total, more than 6000 farms were organic or 12.8% of all Swiss farms. In the canton of Grisons, 58 % of all farms are organic. You can also consult our yearbook and our online database (For 2014 and ealier data). I am a journalist and preparing a report about the organic food market in Europe, its growth, its future. In particular, I am looking for some key figures about the German market, the biggest in Europe and one of the most interesting to explain.I am trying to understand why there is so much organic food is imported by Germany, and I wonder if you have some data about it. What are the main sales channels? Import data for 2012 have been made available by the Agricultural Market Information Company. According to their study Germany is not only the largest market for organic products in Europe but also one of its largest organic producers. In spite of this fact, Germany imported in 2011/2012, 3 to 94 % of organic products, which could also have been produced in the country. Where can I buy a hard copy of "The World of Organic Agriculture"? "The World of Organic Agriculture", 2016 edition, can be bought at the FiBL online shop. The book can also be downloaded there. We are looking for map showing organic retail sales per country. Is this available? Yes, we have a map with retail sales using the STATPLANET software. You can also select agricultural area, wild collection area, shaqre of organic farmland of all farmland and number of producers. I found an older slide presentation on organic per-capita consumption on Organic Eprints (http://orgprints.org/22345/19/willer-2013-session-european-market.pdf. The data in this presentation are from 2011, do you have newer data? Yes, 2014 data are available from our yearbook The World of Organic 2016. You will find the relevant numbers in table 12, page 66. 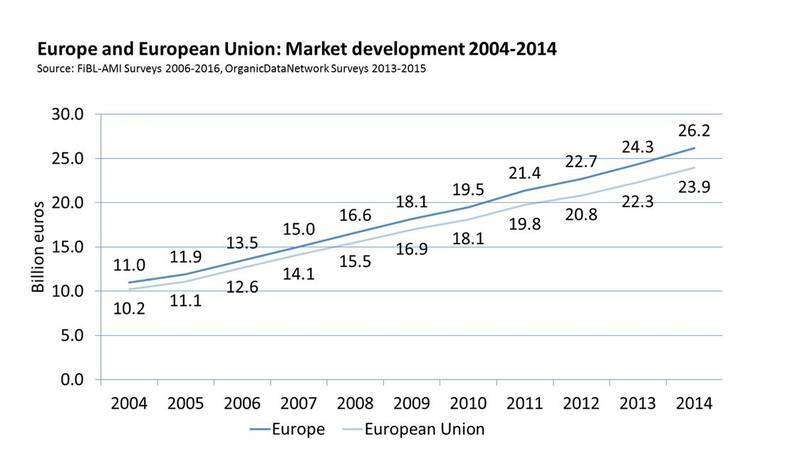 An updated version of the slide presentation on organic in Europe is here http://orgprints.org/29779/7/willer-schaack-2016-european-data.pdf. I am looking for organic retail sales values for Austria. Could you help me to find this data? While we have retail sales data values (in Million EUR) for some countries (see table at the OrganicDataNetwork Website), we generally do not have data for retail sales volumes (in metric tons). Some charts with retail sales volumes are, however, available at the AMA Website. Is it correct that 20 % of the vegetable area in Switzerland is organic ? According to the Swiss Federal Office for Statistics (BfS), 19.6 percent of the farms with vegetable production and 18 % of the vegetable area are organic. The detailed statistics are avaible at the Website of the BfS. I need once again your expertise on organic soy production. I would like to present a graph or table on organic soy area/output in Europe by country. I wondering if you have figures for 2015 on this field. No, unfortunately this data is not yet avaiblle, The 2015 data on organic areas are now started to be published by the countries; from our knowledge most countries should have them by the end of the year. FiBL will start to collect these data from early summer onwards and publish them next February in our yearbook and our online database. However, we have the 2014 area data on soy available in our online database. And we have published 2013 data on area harvested (estimated from the fully converted area) and production (estimation based on fully converted areas and assumptions in organic yields) in the publication "The State of Sustainable Markets - Statistics and Emerging Trends 2015". I am a university teacher and I would like to use some of your slides and figures for my lectures. Is this possible? Yes of course as long as the source quoted. Please find the 2016 slide collection here. Where can I download "The World of Organic Agriculture"? "The World of Organic Agriculture", 2016 edition, can be downloaded here. Furthermore, we have a whole section with relevant and related information (e.g. slide presentations) to the 2016 edition. All editions are available via our "Yearbook" section at this website. I am trying to find statistics charts related to your press release of February on the European market for organic food with data about: organic growth in 2014, retail sales in million Euros in 2014, per capita organic consumption 2014. Could you help me with this? At Biofach I was not able to attend your presentation. Could you send me your presentation? The presentations from our BIOFACH session "The World of Organic Agriculture" area available at our website here. Further slides are available under slide presentations at the section The World of Organic Agriculture 2016. I am a student an Agriculture engineer student. I am writing my thesis about Organic citrus trade in the world. Could I have the production and import data about Oranges, lemons, tangerines? I would like to ask you the permission to use and quote your data at www.organicdatanetwork.net. I am a student studying the European organic market therefore I think your database could give me useful information. For you thesis it is fine, if you quote the data source. If you use larger parts of the data, please show us the data before publication. I was looking through your organic crop production statistics but was unable to find any data relating to organic palm oil. Does FiBL collect such data? Many thanks for your help. FiBL recently published the book the state of sustainable markets, together with the International Institute of Sustainable Development (IISD) and the International Trade Centre (ITC). In this report you will find detailed data about organic oil palm. A summary of this report can also be found in "The World of Organic Agriculture 2016", on pp. 118. I am currently trying to get a sense of land conversion in Europe, while it is too early to have any data showing the impact of the schemes introduced this year I am just wondering if you have anything that gives some indication of land conversion during the last couple of years? Any help much appreciated. Please consult our interactive online data table at http://www.organic-world.net/statistics/statistics-data-tables/ow-statistics-data-crops.html. In these tables the conversion area is available for selected crops. For more details see also our various MS Excel sheets.